LSA Technology was established in 1980 giving nearly 30 years experience in the Information Technology industry; in this time LSA have acquired a wealth of experience spanning the whole range of technology, applications, connectivity & communications, security, problems and solutions. No doubt your computer systems have become a critical part of your business operation. Maintaining efficiency and availability of these systems demands specialist attention to maintain reliability, thereby avoiding loss of work, information and time. Rather than investing in your own in-house team by recruiting & training, then only to discover they leave, or their experience slips behind the IT World’s incessant technological evolution; why not outsource your IT needs to a specialist who will constantly stay abreast of technology, someone who will professionally manage your systems and consult and advise you in order to maintain its efficient & reliable operation. Pro-activity rather than Re-activity prevents problems rather than fixing them. Our advanced remote monitoring & control systems allow fast response without travelling delays. Ensure your computer systems and networks are working optimally. More efficient management avoiding break-fix situations by planned maintenance. Lower running costs by avoiding panic repairs & upgrades. Avoid interruptions to your business by reducing systems downtime. Release your staff to perform their own jobs efficiently. Expert IT consultants available by phone or for meetings. Specialist support technicians familiar with your business and systems. Increase confidence by receiving regular status reports. We are able to provide very cost effective support packages tailored to your specific requirements; we can either provide all the benefits of your own IT Department, but without the associated costs, or we can work with and assist your own IT staff to handle peak workloads, provide holiday cover, or provide expert specialist skills as & when the need arises. Pro-active remote monitoring of critical functions. e.g. server services like: eMail, database, backup & security systems. Backup system monitoring & management. ensuring reliable backups are completed each & every time. Remote desktop/screen connection providing our engineers access & control of your server. allowing fast attention to issues & addressing of problems without disturbing you or your staff. Monitor anti-virus protection of server. Regular status reports emailed to key management staff. reports detailing the server’s status can be eMailed monthly, weekly or daily if required. Pro-active remote monitoring of desktop & laptop computers. allowing problems to be identified before they break or cause disruption. Remote control support of desktop & laptop computers allowing us to assist your PC user. permitting fast & efficient attention to staff questions or calls for support. Anti-virus protection of desktop & laptop computers. 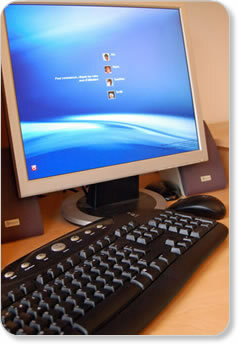 Facility for you/your staff to securely use their PC remotely/from home/etc. providing a highly secure business-grade connection whilst avoiding similar ‘public’ services. reports detailing all PC’s operational status would be included in the regular server report..
hardware and software systems to protect your PC’s both in & away from the office. VPN (Virtual Private Network) links between offices or for remote/home workers. Regular (annual or bi-annual) meetings to discuss systems, current status & future plans.